High Quality Content by WIKIPEDIA articles! 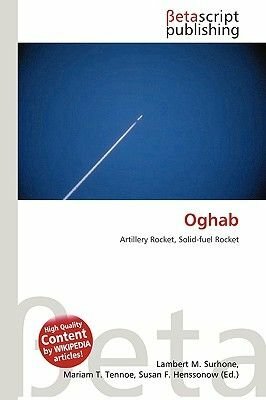 The Iranian Oghab (Eagle) missile is an unguided 230 mm (9 in) artillery rocket with a range of 34-45 km (20-28 mi). It is spin-stabilized in flight but has a proven circular error probable in excess of 500 m (1500 ft), making it a highly inaccurate weapon. It carries a 70 kg (150 lb) high explosive fragmentation warhead, though it may also be able to carry chemical warheads. According to US sources, a modified version has been developed that could be carried and fired from Iranian Air Force F-14 Tomcat and F-4 Phantom II aircraft. The launcher is an elevatable triple-rail launcher assembly fitted to a Mercedes-Benz LA 911B 4x4 truck chassis.